When is EU propaganda not EU propaganda? When it’s commissioned by the UK Government and paid for by British taxpayers? When it’s helpful facts rather than belligerent opinions? Or when you just happen to agree with it? 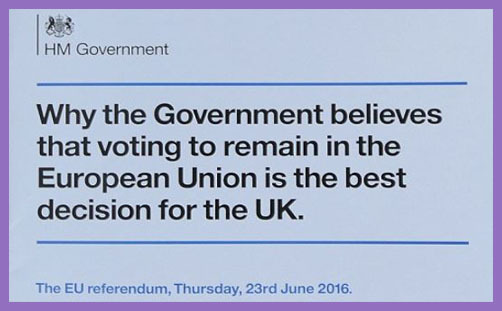 So what’s the problem with splashing out £9million to send this to 27 million homes to inform, educate, enlighten and invigorate the people into voting ‘Remain’? The problem (though it isn’t really singular) is that these statements are not facts. For a start, the matter of joining the euro is for a future government to decide, and parliament may not bind its successors. If Jeremy Corbyn wins the 2020 General Election with a commitment to join the euro, he ought to be free to do so; not bound by whatever David Cameron felt was right for him, his party and the country years before. That’s democracy. And how can we keep control of our own borders when we have already lost it? Surely the most cursory assessment of why the Prime Minister’s pledge to reduce immigration to the tens of thousands has not been honoured (and never will be) is because he cannot control the numbers of EU nationals who choose to live and work (or not work) on the UK? And to state that the UK will not be part of further European political integration when our ‘opt-out’ from “ever closer union” is not enshrined as a treaty amendment is blatantly duplicitous. These are complex matters of international law and domestic legal interpretation, and that very complexity subverts the crass assurance of a blanket ‘opt-out’, not least because “ever closer union” has always permitted relative, creative and various approaches to the process. Consider that the wording of the ‘renegotiation’ includes an explicit reference to the new settlement being “fully compatible with the Treaties”. So, the UK ‘opt-out’ from “ever closer union” is “fully compatible” with the Treaty of Rome’s objective toward “ever closer union”. This is Alice in Wonderland stuff. It is not a binding EU treaty or EU law in itself. Most legal opinions consider the first part of it, the Decision of Heads of State or Government, to be a binding treaty under international law, largely because the parties to it have declared that they intend it to be legally binding. But even if the Decision binds the parties under international law, it does not bind the EU institutions, and is not necessarily legally enforceable under either EU or domestic law. It could be very problematic if either the Court of Justice of the EU or a domestic court found an inconsistency between the Decision and the EU Treaties. The fact remains that the UK’s membership of the EU will still be subject to decisions made by QMV (no veto) in many areas of law; and the incremental ratchet approach to assumed and exclusive competences over so many matters of regulation. When laws and diktats may still be imposed, in what sense are we liberated from deeper political integration? As for the “tough new restrictions on access to our welfare”, David Cameron has been thwarted by the supreme EU Government from honouring his manifesto pledge (that is, his assurance to the British people by which he was democratically elected) to ensure that EU migrants who want to claim tax credits and child benefit must live in the UK and contribute for a minimum of four years. And the “commitment to reduce EU red tape” is nice and buzzy, isn’t it? The EU is economically sclerotic and globally uncompetitive: 28 nations cannot and will not agree on what constitutes ‘red tape’, so a commitment to reducing it will mean different things to different heads of state. As long as goods need standards and services need regulation, there will be red tape. Bureaucrats eat, breathe and excrete it. Red tape is going nowhere. “Why the Government believes..” is a creed of deception, dishonesty and disinformation. These ‘facts’ are nothing but articles of blind faith in an otiose supranational structure which has had its day. £9million blown on EU propaganda? Yes, Prime Minister.